To test if carbachol (CCh)‐evoked Ca2+ oscillations in freshly isolated murine detrusor myocytes are affected by β3‐adrenoceptor (β‐AR) modulators. Isometric tension recordings were made from strips of murine detrusor, and intracellular Ca2+ measurements were made from isolated detrusor myocytes using confocal microscopy. Transcriptional expression of β‐AR sub‐types in detrusor strips and isolated detrusor myocytes was assessed using reverse transcriptase‐polymerase chain reaction (RT‐PCR) and real‐time quantitative PCR (qPCR). Immunocytochemistry experiments, using a β3‐AR selective antibody, were performed to confirm that β3‐ARs were present on detrusor myocytes. The RT‐PCR and qPCR experiments showed that β1‐, β2‐ and β3‐AR were expressed in murine detrusor, but that β3‐ARs were the most abundant sub‐type. The selective β3‐AR agonist BRL37344 reduced the amplitude of CCh‐induced contractions of detrusor smooth muscle. These responses were unaffected by addition of the BK channel blocker iberiotoxin. 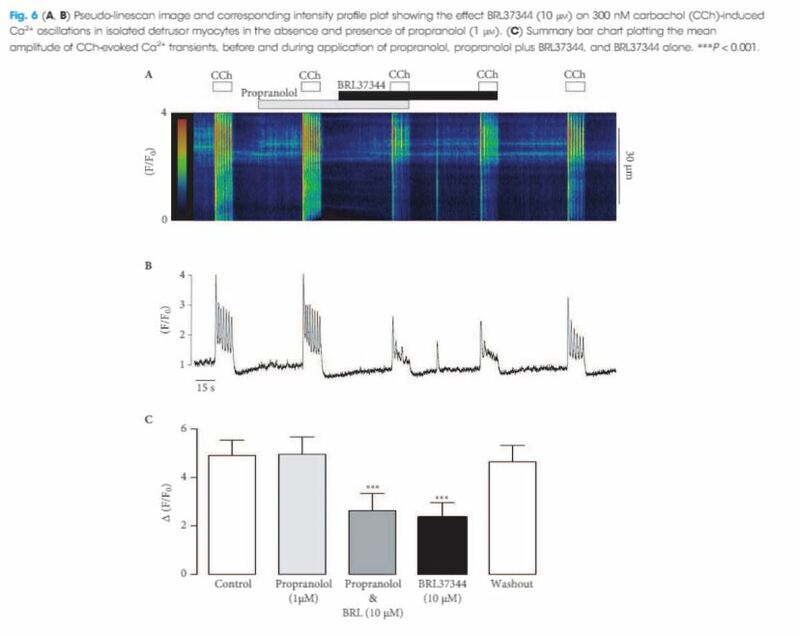 BRL37344 also reduced the amplitude of CCh‐induced Ca2+ oscillations in freshly isolated murine detrusor myocytes. This effect was mimicked by CL316,243, another β3‐AR agonist, and inhibited by the β3‐AR antagonist L748,337, but not by propranolol, an antagonist of β1‐ and β2‐ARs. BRL37344 did not affect caffeine‐evoked Ca2+ transients or L‐type Ca2+ current in isolated detrusor myocytes. Inhibition of cholinergic‐mediated contractions of the detrusor by β3‐AR agonists was associated with a reduction in Ca2+ oscillations in detrusor myocytes.